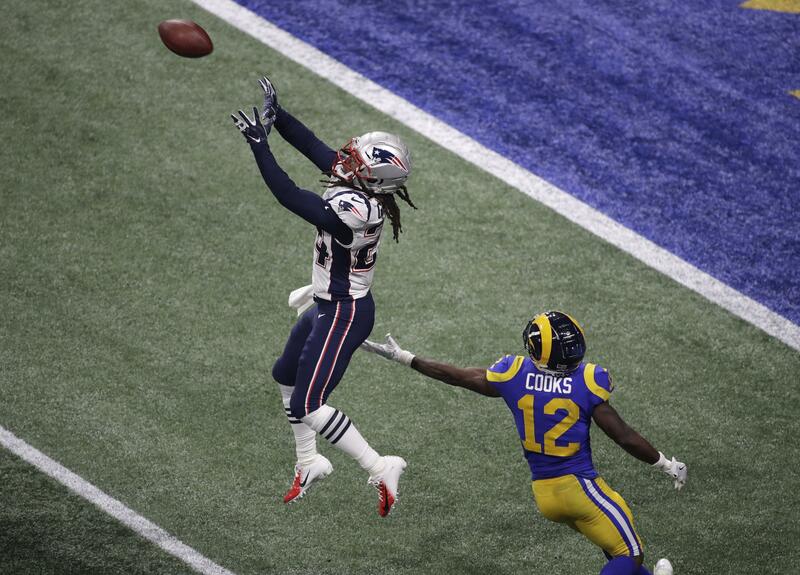 Tue., Feb. 5, 2019, 8 a.m.
Jason McCourty raced across the field to break up a would-be touchdown toss to Brandin Cooks, who was wide open – but … had … to … wait … forever … for Jared Goff’s rainbow pass that was knocked away just as it arrived. Stephon Gilmore intercepted Goff’s pass in front of his end zone with 4:17 remaining on a pass intended for Cooks to seal the sixth title for Tom Brady, who outplayed Goff, and Bill Belichick, who outsmarted Sean McVay. The Rams may very well represent the future with their 33-year-old coach and 24-year-old quarterback, but the 66-year-old coach and his 41-year-old QB still reign supreme in 2019 – thanks again to a defense that allowed the duo to survive another masterful game plan by Rams defensive coordinator Wade Phillips. Brady’s worst Super Bowl – three scores in 11 drives that didn’t end in kneel-downs – also was his easiest – a 10-point margin of victory was his highest ever. Published: Feb. 5, 2019, 8 a.m.